Born in Montreal, Bill Saunders acquired a love of Quebec scenery at an early age. He started sketching when he was four years old, painting when he was twelve. His passion only grew through his teen years. More than fifty years later, that passion is still there. Bill paints almost every day…pursuing more dramatic skies, the shimmer of sunlight on water, the never ending dance of shadows and sunlight…every painting a new challenge, a learning experience! Time and again, he has captured the timeless serenity of an aged farmhouse on a lonely country road, a secluded lake amidst rolling hills or a sugar shack hidden in a forest of maples. These are scenes he cherishes and tries to preserve through his paintings. As the world rushes forward, Bill Saunders hopes that these scenes will never disappear. Italy, where his grandfather was born, has recently become a source of inspiration as well as a challenge to capture the old world charm and intricate architectural detail. Painting with acrylics, he takes a realistic approach to all his paintings and endeavours to include the most important details. Bill’s paintings were first displayed in a Montreal area gallery in 1968. As demand for his works continued to grow, he quit his secure position with BP Canada June 15th, 1977 and has been painting full time since then. 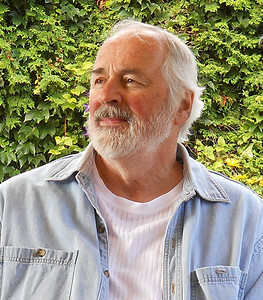 His works can be found throughout Canada and the United States.